Bear Valley is a family-oriented Sierra mountain resort in Alpine County, located between Lake Tahoe and Yosemite, only 3.5 hours from the San Francisco Bay area. Bear Valley is located off of Highway 4, a less traveled and highly maintained road that almost never closes in winter. In the Winter, Bear Valley cabins are closed to cars, (pedestrian and snowmobile access only) adding to its beauty and peacefulness. After you park once in the central parking lot, this cabin is only a 10 minute walk from the Bear Valley Lodge and Restaurants. FREE shuttle buses take you right to the ski lodge every hour and back home on the half hour, or you can ski down the Home Run at the end of the day, right to the cabin door! This updated and cozy cabin features four bedrooms and a loft, two full baths, large living room with gas stove, and updated kitchen. There are three bedrooms upstairs: Room #1 has a full-size bed and connects to a bathroom; Room #2 has a queen-size bed; and Room #3 has two twins beds. The downstairs bedroom #4 has a queen-size bed. Bear Valley offers a great variety of activities from skiing in winter to hiking, biking, and other summer activities including classical and popular music festivals. If you are looking for a less crowded alternative to other busy mountain resorts like Lake Tahoe, Bear Valley is the place for you. We provide plastic sleds for you to carry in your belongings; snowmobile transportation service can be arranged from the Bear Valley Transportation Center if required for an extra fee. 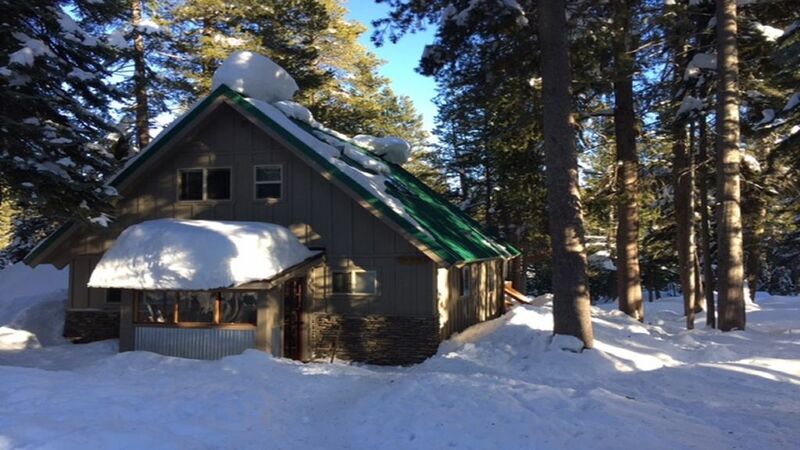 Cabin is a 7-10 minute walk to the Bear Valley Lodge and Ski Mountain shuttle bus pick up area. Great family cabin and resort! Loved the cabin and the resort. Neat to stay in a snow village with no paved roads. We've rented this place out and it's been great both times. Comfortable and quiet and we'll located. Lots of snow this year! We stayed in the cabin for a weekend of skiing at Bear Valley ski resort. The cabin was warm, comfortable and great for two families for the weekend. It was a little unusual to have to hike into the cabin as the road to it is not plowed in the winter. We arrived at night but it wasn't too hard to find. They had the lights on. The sleds made it pretty easy to get all our stuff into the house. The kitchen was very well set up with everything we needed. There were four bedrooms, comfortable for everyone. We would definitely rent the cabin again. We had a great weekend. Warm, cozy cabin with all the amenities -- even two snow shovels which we used during a snowstorm. Close to Sno-Parks, sledding, and skiing. Highly recommended. Well, I hate to leave a rave review about this place as I would like it to be a best kept secret, but that's impossible, this place was too fantastic! We really enjoyed our stay here. Nicely decorated and clean. The kids couldn't have been happier with all the snow around the cabin. The fact that you have to hike in (really, it's just a short 10min walk) to the cabin, made it that much more unique and exciting. We really loved it. Every local I met was as happy and as friendly as you could imagine. We will definitely be returning in the future. Thank you, Sue. Thanks Mike, for staying with us! A warm and lovely stay extremely convenient to services and cross-country at Bear Valley. I stayed at the cozy cabin with two girlfriends for two nights to catch what turned out to be the first ski-able days at Bear Valley. We absolutely loved the cabin which was very nicely decorated with a super efficient propane heater which looked like an antique woodstove in the center of the comfy living room. Views of snow bedecked pines all around and amazingly clear stars in the middle of the night. Kitchen was well outfitted with appliances and all needed to cook up a storm. Bedrooms were simple and each had their own oil heater so we could achieve our perfect temps. An entrance with bench and room to store boots made coming and going in snow very easy. It appeared new very attractive cabinets, countertops and lighting updated the family cabin decor. Sue was a great communicator and very helpful. Thank you for a wonderful stay!